Watch My Food Network Web Series! 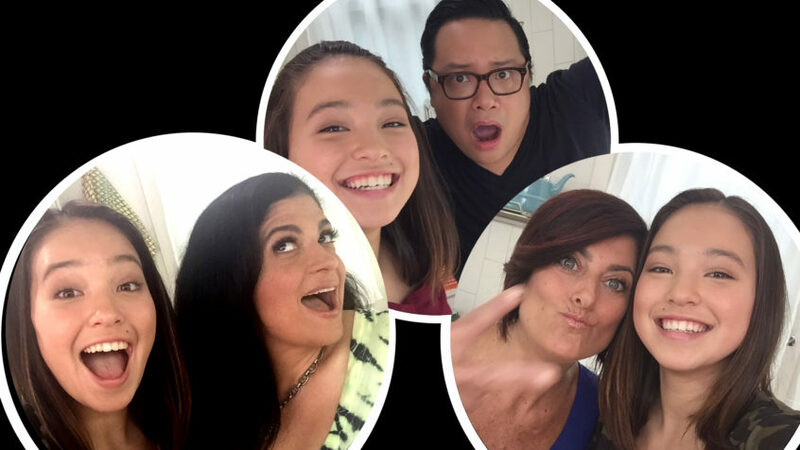 I am still on cloud 9 from winning Food Network Star Kids! I got to create a web series on foodnetwork.com with 3 amazing chefs – Chef Alex Guarnaschelli, Chef Dale Talde, and Chef Ariane Duarte! Check them out, then scroll to the bottom for the recipes. 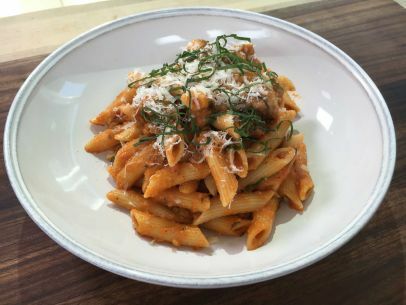 Chef Alex Guarnaschelli and Star Kid Amber Kelley collaborate on an easy pasta dinner for families. Star Kid Amber Kelley and Brooklyn-based Chef Dale Talde make simple veggie dumplings from scratch. Together, Star Kid Amber Kelley and Chef Ariane Duarte transform pork sliders with a cool peach salsa. And of course, I want to give you a behind-the-scenes look at my experience, so here is my vlog of the trip. They were so much fun and I learned a ton from them! Thank you so much Chef Alex, Chef Dale, and Chef Ariane! And thank you to Cat, Jennifer, Maria, and everyone else who helped make this amazing series! Heat a large skillet over medium-high heat and add 1 tablespoon of the oil. When the oil just begins to smoke, add the sausage, breaking it into small pieces with a wooden spoon. Cook, stirring occasionally, until the sausage is browned and crispy, about 8 minutes. Transfer to a paper-towel-lined plate. Reduce the heat to low. To the same skillet, add the red pepper flakes, garlic and shallots. Season with salt. Add the oregano and stir. Cook until the garlic and shallots are tender and translucent, 3 to 5 minutes. Place a strainer over a medium bowl. Quarter the tomatoes and, working over the strainer, scrape the seeds and "jelly" from each piece. Push the liquid through the strainer and discard the seeds. Add the tomato flesh and liquid to the shallot mixture and stir in the sugar and 1 tablespoon salt. Reduce the heat to medium and cook until the tomato flesh starts to lose shape, about 10 minutes. Add 1/2 cup water and simmer until the tomato sauce is mushy, 15 to 20 minutes. Season with salt. Meanwhile, bring a large pot of water to boil and add salt. Cook the pasta, stirring so it doesn't stick to the bottom, until al dente (chewy but not hard or raw tasting), 8 to 10 minutes. Drain the pasta, reserving a bit of the pasta cooking water, and set aside until the sauce is finished. Transfer the tomato sauce to a blender and puree until smooth. Add the balsamic vinegar and blend again. With the blender running, pour the remaining 1/2 cup oil through the top in a slow, steady stream. Blend in 1 cup water then transfer the sauce to a large skillet and add salt to taste. Place the skillet over medium heat and add the pasta. Stir to combine with a wooden spoon. Cook until the sauce and pasta are heated through, about 6 minutes. If the sauce is too thick, add some of the reserved pasta cooking water to thin it out. Drain any excess grease from the sausage and stir it into the pasta. Season with salt. Tear the basil leaves over the pasta and sprinkle with Parmesan. Chef Dale Talde is not only a talented chef who is known for mashing up Asian and American dishes, but he's also a total goofball and a lot of fun! These dumplings are inspired by his pork and chive dumplings at his restaurant, Talde. 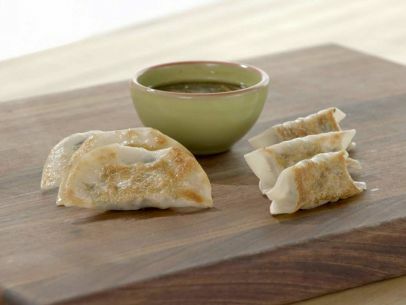 Check out the video on Foodnetwork.com to see several ways to fold the dumplings! Let's have a dumpling party! For the dumplings: Trim and discard the stems from the mushrooms and finely chop the caps. In a large saute pan, heat 2 tablespoons of the vegetable oil over medium-high heat. Add the mushrooms, working in batches to avoid overcrowding the pan. Cook until golden brown, 5 to 8 minutes. Add salt to taste. Transfer to a large bowl to cool. To the same pan, add 1 tablespoon vegetable oil and heat over medium-high heat. Add the kale and cook, stirring, until wilted and most of the liquid has evaporated, 6 to 8 minutes. Add salt to taste. Transfer to the bowl with the mushrooms. Finely crumble the tofu into the bowl with the mushrooms and kale. Add the cilantro, scallions, soy sauce and sesame oil and mix well. Add salt to taste. Cover a baking sheet with plastic wrap and dust with cornstarch. Wet the edge of a dumpling wrapper with water. Place about 2 teaspoons of the tofu-mushroom filling in the center and fold to form a half-moon shape. Press the edges to seal well. Place the sealed dumpling on the prepared baking sheet. Repeat with the remaining filling and wrappers. Place a medium saute pan over medium-high heat and add 1 tablespoon vegetable oil. Working in batches, add the dumplings in a single layer. Add about 1/4 cup water and cover. Cook until the water has evaporated, the bottoms of the dumplings are golden and the wrappers are fully cooked and somewhat translucent, about 5 minutes. For the dipping sauce: In a small bowl, whisk together the soy sauce, vinegar and sugar until the sugar is dissolved. Add the ginger and sesame oil and stir to combine. Serve the dumplings with the dipping sauce. These are incredible. Sweet, savory, juicy, and so flavorful! The sliders are inspired by chef Ariane Duarte's juniper cured pork chops at her restaurant, Ariane Kitchen and Bar. Check out the video on Foodnetwork.com too - we had a blast! For the pork sliders: Combine the pork, parsley, scallion, garlic, 1 tablespoon salt and 1 teaspoon pepper in a medium bowl. Mix well and divide into 4 equal patties. Pat the patties dry with a paper towel and season both sides with more salt. Grill the patties until cooked through and nice grill marks develop, about 4 minutes per side. Transfer to a platter to rest. For the grilled peach salsa: Lightly coat the cut sides of the peach halves with 1 tablespoon of the oil. Grill the peaches cut-side down until slightly softened and nice grill marks develop, 4 to 5 minutes per side. Transfer to a cutting board until cool enough to handle, then dice. Whisk together the balsamic vinegar, sugar, shallot, remaining 1 tablespoon oil and a pinch of salt in a large bowl. Tear the mint leaves into the bowl. Add the diced peaches and gently stir to combine. 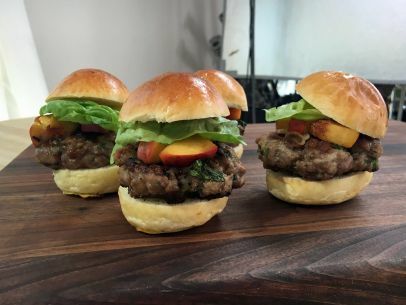 Place the pork patties on the buns and top with the grilled peach salsa. I left a message on another page too. My wife and I have followed Amber, being from the PNW we , since she was on with Rachel and Guy. How do we get Ambers’ show , her Food Network series, either sent to us, put on out email or onto Facebook? Or do we need to do a ‘Search’ every time? Thank you for your comment! You can subscribe to my Youtube channel but clicking the “Subscribe” button on https://www.youtube.com/user/CookWithAmber , but to see the Food Network web series, you can go to this page: http://www.cookwithamber.com/watch-my-web-series-on-food-network/ I hope this helps! Thanks again! Amber, Congrats on your Food Network win. I don’t have cable TV so I had not seen that. You are such a poised and accomplished young woman. I’ve been following your YouTube channel for a couple of years and I’m always impressed by your videos. You go Girl!